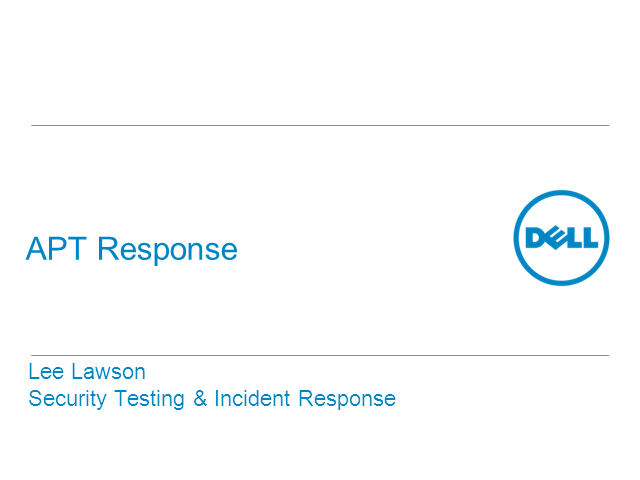 The Dell SecureWorks Counter Threat Unit has monitored and responded to hundreds of APT attacks across our 3,000+ customer base in the last 12 months. The information gathered from this activity – and information shared with intelligence agencies around the world - includes advanced knowledge of the adversary, their tools and techniques. Most importantly the Counter Threat Unit has perfected how to identify, protect against and respond to APT attacks. This webcast will examine the threat posed by Advanced Persistent Threats and look at the lifecycle of an attack. Lee Lawson, Security Architecht at Dell SecureWorks, will walk through a genuine APT attack and look at the different phases of attack that were encountered. Considering the motivation behind these attacks, and the range of tactics which are used, how concerned should you really be? Lee will give insight into best practice for protecting your organisation from APTs, and how you should respond once an incident does occur. Lee Lawson is the Solutions Architect for Security and Risk Consulting Services at Dell SecureWorks EMEA. In this role he is in charge of envisioning and creating combinations of new and existing services to solve the most unique and difficult customer problems. His past experience was as a Principal Consultant managing the EMEA Security Testing and Response team responsible for all adversarial-testing services such as penetration testing, social engineering and physical intrusions, and all responsive services such as digital forensics and security incident response/handling. This background has provided him with a deep knowledge of the subject having led complex and challenging projects for customers in all industries.